I first met Jimmy at one of his London seminars in late 2010 and was very impressed so I joined his program back in Jan 2011 and went to Guernsey to do the training. As well as being great fun, it was extremely good training. Jimmy covers all topics including technicals, fundamentals, trading mind set, news trading and basic common sense. He has been a forex trader for many many years and has a great enthusiasm for teaching and mentoring. There is no hard sell and he is very honest and says it like it is. He has a great ability to adapt to the changing market and to identify the import factors influencing the market. I can highly recommend Jimmy as a forex teacher and mentor and also a really fun guy. I joined Jimmy’s training program in 2012 and have been trading successfully since. I liked his approach to trading and his style as it made sense and worked. I learnt not just to follow instruction but also to think like a trader putting emphasis on psychology and being sensible. As part of Jimmy’s program he provides his students with a live trading room, daily webinar and a Tradefinder spreadsheet. This support and the ability to communicate with him easily added to my knowledge and confidence and to making meaningful profits. I've have been with Jimmy for for years now and can tell you learn to trade forex through repetition and Jimmy's program is design to to go through the systems he teaches over and over again. He provides market overview every day he's also has created an online trading room where you can learn from him and other experienced traders when and why to place a trade. You will learn EVERY aspect of forex trading in depth and very clearly. I took the course in 2010, and since then I have been a full time trader with great success. Jimmy is a great teacher and a great guy. I learn with him about every topic from fundamentals, technical analysis and every aspect you need to know to be a successful trader. In his course, he also gives you specifically trading systems that are very useful. But the most important thing that I learn was to have a deep understanding of the forex market. to gauge if the market is trading on fundamentals, technicals or risk and to make my own analysis. Everyday I make my own analysis of what happened in the market and what I am expecting for the next day. When it is time to trade I can easily identify where are the opportunities. If you are serious about becoming a full time forex trader, this is the way to go. Just want to add to my review from last year. I have known Jimmy for about a year and have found this advice to be fantastic. He is a straight talking guy but this is what you need to get the discipline of thought you need to succeed in trading the markets. I have developed some of the methods Jimmy has taught me so that I have my own approach to the markets. I notice that Jimmy is currently offering a $100 programme on his website which I think is a great deal and probably the best there is out there at the moment. Jimmy could probably retire and put his feet up but I admire the fact that he is still wants to train and nurture new traders. But...I have to say to anyone reading this. You have got to take Jimmy's advice on board but you also have to WORK! There is money to be made out there but you can't expect to just earn it without walking the walk. Jimmy will provide you with a SOLID FOUNDATION from which to build your own approach. Just wished I had been with Jimmy years ago. Would have saved me a lot of money. In conclusion - Jimmy is quite simply the best forex educator out there and $100 for his programme is simply a no brainer if you are SERIOUS about this business. Apr 9, 2017 - 5 Stars If you want to be a successful Forex trader then this is the guy you need to learn from. I had spent 10 years learning and trading just using technical analysis. Sometimes I would win, sometimes lose but never seemed to make any real progress. I would spend hours and hour just looking at charts, trying to understand where I could make money from them and not seeing the bigger picture. I recently heard about Jimmy Young and researched him on the internet. He has been in this game for 30+ years and had worked at some of the big financial institutions. I guessed this guy should know his stuff...! That was an understatement. Jimmy has such a vast wealth of experience and has totally opened my eyes to how the markets actually work and shows you that, with a lot of hard work, you can trade the markets successfully. Don't expect a magic formula or MT4 plugins. Expect hard work, dedication and perseverance in order to build a solid foundation upon which to take your Forex trading forward. And on top of all of this - a very nice guy too! I would not hesitate to recommend Jimmy Young's teaching to anyone looking to make it in this game. Don't bother with the stuff on a google search. Just contact Jimmy and get stuck in! I am reversing my review. I had thought he had brushed me off, but accepted me. I am in a few sessions and think he is really caring about his students. I apologize for the nasty comment, but had thought I was rejected. He's great. I spent 20 years as an Institutional GBPUSD trader so most of my trades are in GBPUSD actually. A little in EURUSD and USDJPY. The commodity currencies I rarely trade. My strategy is not a simple one. I expect you to be able to choose when to take the signals from about 10 possible strategies and each strategy having sub tactics. I guess what I am trying to say is that I teach people to be a trader and not to trade an idealized strategy that happens to be working in this current environment but will likely fall off the bus when the market takes on a new theme - a new face. My suggestion is you move on and go with someone who will promise to deliver exactly what you are looking for. A trading strategy that really works. This is Jimmy Young. I have been a member here since 2009 and enjoyed a near perfect review record until recently when I received two one star reviews. I did nothing wrong. Both reviews were retracted but that does not negate the negative impact of those reviews. For this reason I am instituting a train first and pay later policy. I do so reluctantly because I open myself up to timewasters; people who sign up for things and don't follow through or follow through halfheartedly. I want to be clear the training is not free going forward. But you will not be required to pay until after the training is completed and only then if you feel you did not get the value you expected. I make it clear what to expect to there is no confusion. But you will still have a no obligation choice not to pay if in your estimation the training was not worth it. Truthfully, for what I am charging ($100 for a 2 month program) there is no better value out there. Hello admin, please remove my bad review from Jan 29, 2018, I have spoken with Jimmy Young directly thru email and he has refunded me the $150. Sorry about submitting the negative review I should of told him what I felt directly instead of submitting first. He kindly refunded me with no hesitation. Jan 29, 2018 - 1 Star This guy is full of cr**, honestly I really don't understand all the good reviews this guy receives. Before he would charge $150 a month and all you would get is put in his special "LIVE TRADING ROOM", in which he does not make much trades and if he does most of them are losers. Some of the other traders in his trading room seem to know more than him. You also have access to his daily TRADEFINDER, which basically he gives you info on the markets, but you can find for free on the web. He also claims about email support. I once asked him about a question in his tradefinder about where and when to take a trade if possible. And he went on a rant about that he is not a signal provider and he just gives out the info its up to me about making my own trades. If the genius would of read the question right I did not ask him about him doing a signal service I asked about some tips in trading the market which i feel i should have gotten since i was paying $150 at the time. Now he has $100 for skype 1 on 1. He is changing the price which is why I think he is losing subscribers. This is why i think his service is bull cr** for someone claiming to have more than 20 years Forex market experience. I searched my database and email archive and was unable to find you (Tony, New York); nor was I able to find the email you refer to. However, I do recall responding to what I interpreted as a condescending question with “I am not a signal caller”. Based upon the entirely of your post it’s clear to me you are sincere and clearly was unhappy with the service you received. Please accept my sincere apologies and a full refund of the $150.00 you paid. Send me an email with instructions on how you would like to receive your refund and I will get it out to you without delay. Concerning the service and my many good reviews I suspect there was a better communication and expectation for the service. In fact I continue to receive many emails from clients thanking me for a job well done. I have been subscribing Jimmy Young's trading education service only for the last 6 months, but i can fully confirm everything has been written in the last comments. I do not want to be repetitive and boring, and also English is not my mother tongue and i am not so effective in expressing my view. But i join the other enthusiastic people and i am grateful to Jimmy for giving us his competence and professionalism, for sharing his priceless experience and skills, and also for his availability and patience in giving precise and real time individual answers to all our doubts and questions. Summarizing, it's not a long time i am follow Jimmy's training, but i already see a great benefit in my trading. My first attempt to trading was back in 2000 and the internet bubble... As I wanted to be a better trader, I enrolled in several well-known trading academies in London and spent a lot of money in the endeavour. All I got was a few technical hints and bad advices, so in a nutshell, I was not successful. The chat room moderated by Jimmy is a mix of traders of all kinds from newbies to very experienced and I find it a good place to learn as everybody is free to express his view. Thank you Jimmy for your professionalism and for sharing your 37+ experience with all of us, and specifically, thank you for allowing me to be a better trader. 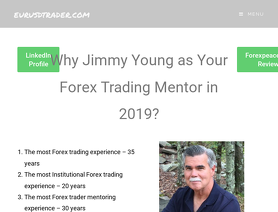 In Mr Jimmy Young, you will not find a more genuine honest person teaching forex. For anyone wanting to join him this will be one of the best investments you can make. What I really like is he will tell how it i and I really like strait talking people. You know where you stand. One of his best sayings which I love. In any relationship you have in life be it personal or in business there has to be TRUST without it none of it works. TRUST is earned over time and it is the key to a successful business relationship. Jimmy Young has earned my TRUST and that means alot to me and I feel he trusts me, as he does all his students. In my humble opinion trust is king and I totally recommend Jimmy Young . Apr 23, 2013 - 4 Stars If you really want to be a Forex Trader and I mean do you really want to be a Forex Trader. Then in my opinion joining Jimmy Young will give you the best start you can possibly get. But do not think that your going to play at this and make money. You have got to be serious and dedicated. Then using what Jimmy delivers will work for you. It has for me.